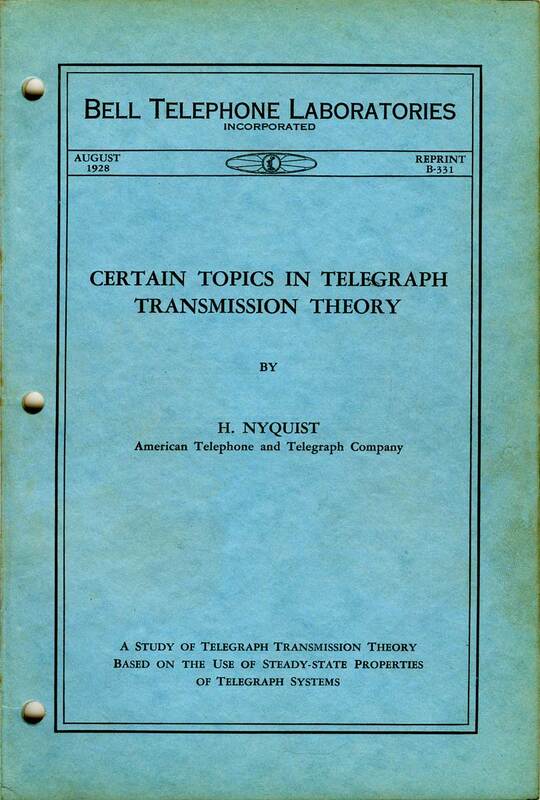 Introduction: Beginning in the early 1920s, Bell Labs, at that time the world-renowned research arm of AT&T, produced a large number of reprints of technical papers written by the company's engineers. Published in a uniform 9" x 6" softcover format, the Technical Reprints had a wide variety of content. While most were specific to diverse aspects of the company’s business, some also covered more general scientific and engineering topics. The 1920s was a decade of many technical advances, leading to competition for message traffic between the new high-speed submarine cables and the even newer worldwide radio communication systems. Consequently, quite a few of the papers concern submarine cables, transatlantic radio, landline telegraphy and telephony, and the theory of how communications circuits can be most efficiently worked. Twenty years later, this work formed a substantial basis for Claude Shannon’s formalization of what became known as Information Theory. 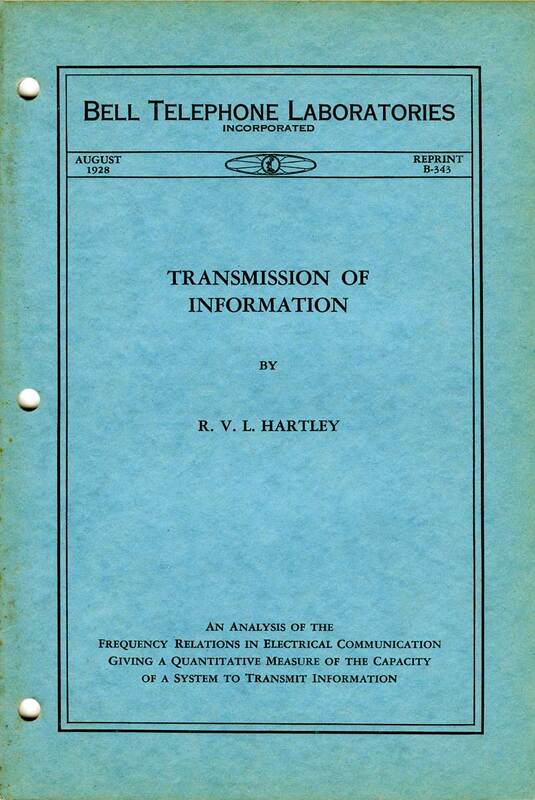 The principles he established provide the theoretical basis for all modern forms of data transmission and storage. The table below, which gives details of Technical Reprints B-1-1 through B-533, is reproduced from the numerical list in the March 1930 issue of Index of Technical Reprints, which also includes an appendix with additions to November 1930. The date of the reprint (where shown) is taken from the cover of each publication, and the title, author(s) and source of each paper are given. The original index also includes sections by author and topic, but these are not reproduced here. Some of the papers most relevant to long-distance cable and radio communications are marked by an asterisk in the Ref column. John C. Latham’s introduction to the Technical Papers was first published in the Bell Laboratories Record, May 1926. A run of that publication from 1925 to 1961 is available on the American Radio History archive website. 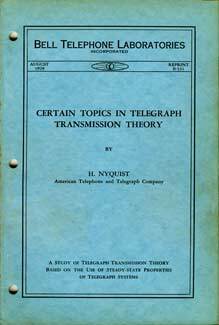 In 1919. it was decided regularly to obtain a number of reprints of the important articles which our Bell System engineers were publishing in various technical journals for distribution within the Laboratories. Each advance in the art which such papers recorded became immediately a source of ideas for further advances. Particular reprints thus became part of the necessary equipment of particular laboratories. With the distribution of these reprints, a demand was created which has grown until today it causes the distribution of our technical reprints not only within our Laboratories and the Bell System generally but, as the knowledge of their existence has slowly spread, to colleges and scientists and engineers throughout the world. The demand which has required expansion in the circulation of these reprints may be due to a number of factors among which, besides the paramount one of the scientific value of the contributions themselves, is the fact that they form a continuous series of articles covering most of the subjects of interest in communication engineering. They appear in individual pamphlets of convenient size, and are rendered easily accessible by means of a complete index. Whatever the cause. the few hundred copies originally published have grown to thousands. Of these, practically twenty per cent are distributed in the Laboratories, approximately forty per cent go to the American Telephone and Telegraph Company, Western Electric Company, and other associated and related companies of the Bell System. About twenty-five per cent go to the libraries and faculties of colleges and universities and the rest to public libraries and individual scientists. They have even reached the point of being adopted by a number of colleges as text-books for courses in electrical engineering and physics. In the course of their expansion in numbers and circulation, the reprints have also changed in physical form. The greatest change, of course, was that from the heterogeneous collection of bindings and page sizes supplied by different technical magazines to a uniform binding and page size. The accomplishment of uniform page size of articles printed in journals of such varying dimensions appears to be a source of considerable mystification to persons outside the Company. In fact, we have received a number of letters inquiring how it was possible to accomplish it without entirely resetting the original type. As a matter of fact, this uniformity was simply a matter of measurement. Our reprint page-size (six inches by nine inches) is practically the only size which can be used to reprint articles from the “single column” magazines in which many articles by engineers of the Bell System are originally published, while retaining a comfortable margin and column arrangement. Articles published in “double column” magazines are rearranged into single columns. The only other changes necessary are a rearrangement of the type pages sufficiently to cause each article to begin at the top of a right-hand page, the renumbering of the pages, and the elimination of the “running head” of the original magazine which usually occurs at the top of each page. With the distribution of the reprint index which is now in press, it is expected that the reference value of our series of technical reprints will be increased. This new index differs in a number of particulars from that issued in 1925. More than fifty new titles have been added, as well as information as to the original source of each article. In order to make the series easier of reference, a small group of reprints originally numbered as the “C” series has been renumbered into the present “B” series. B-14-1 Audiometric Methods and their Applications E. P. Fowler M.D. Jul 1925 B-133-1 Frequency Characteristics of Heart and Lung Sounds R. C. Cabot, M.D. Feb 1927 B-229 Analysis of Heart Sounds H. B. Williams, M.D. Oct 1928 B-349 The Aluminum Electrolytic Condenser H. O. Siegmund To be Published in Electrochem. Soc. L. M. Ilgenfritz To be Published by A. I. E. E.
Mar 1929 B-381 Weller Brittleness Test for Paper R. L. Peek, Jr.
T. E. Shea To be Published in A. I. E. E., Trans. B-443 Dial Telephone System Serving Small Communities of Southern California F. O. Wheelock To be Published in A. I. E. E., Trans. * B-512 Long Telephone Lines in Canada J. L. Clarke To be published in A. I. E. E. Trans. C. W. Borgmann To be published by Electrochem. Soc. 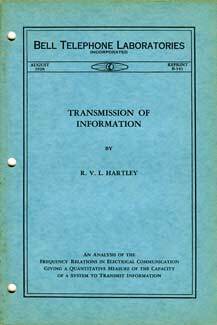 Radio transmission for television Edward L. Nelson. A group of six papers presented at the Lake Placid conference of the Society of Motion Picture Engineers outlining the fundamental factors involved in the production of sound pictures.